“Being Present”, a new collection of original oil paintings by Sue Foell will open on Friday evening, May 3rd at the Dare Gallery, 31 Broad Street, Charleston, SC. This series of paintings is about connections and moments reminding us to live our best life; by taking time to yourself, feeling the calm and quiet of dawn, really focusing on a soft touch on skin, snuggling with a puppy, savoring the glistening of fresh strawberries, contemplating the meditative beauty of the sea or the warmth of sunrays on your face. Sue Foell has always found joy in creative pursuits and “making things”, but she did not have a traditional academic art education. Her ever growing masterful body of work and the number or prestigious awards for this work would lead you to believe otherwise. Foell says that she has very early recollections of watching her father, a high school art teacher sketching head studies of her and her siblings, which sparked an interest in portraiture that would blossom later in life. Although she majored in Computer Science in college, the many art courses she took while there and later from several other private instructors gave her a strong foundation for her paintings today. 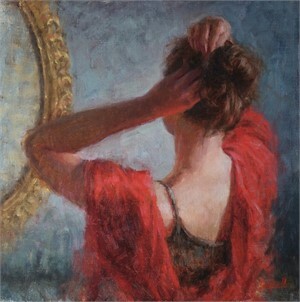 After working as a graphic artist for 14 years, she took a portrait workshop in 2001 from prominent Houston portrait artist William J. Kalwick, Jr. She knew right away that portrait painting in oil was what she was born to do and continued to study with Mr. Kalwick for the following four years. 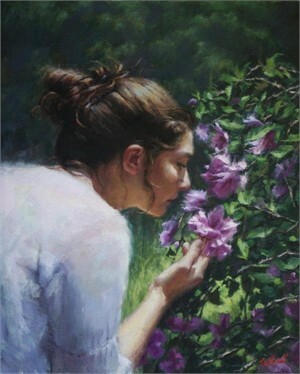 Sue also studied still life painting with Bruce Williamson and Qiang Huang and landscape painting with Roger Dale Brown. Foell says that all of these resources have definitely made her a better painter, but that the far most valuable tool in honing her skills has been actually putting in the hours of painting daily. 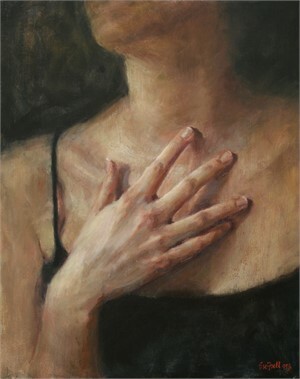 Foell’s convincing sense of light and shadow, confident brushstrokes, strong drawing skills, and use of rich color give a special strength to her paintings. Her work is also critically acclaimed, receiving numerous major national awards over the last twelve years. 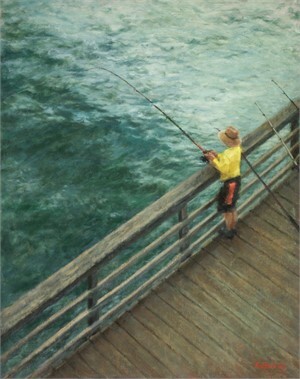 Some of the awards of note are the Figurative Award of Excellence at the Oil Painters of America’s 2015 National Exhibition of Traditional Oils, having paintings accepted into the Salon International from 2007 through 2013; acceptance into the Oil Painters of America’s Eastern Regional Exhibition and/ or the National Juried Exhibition for eleven of the last twelve years; and the 2019 Virtuosos of the OPA Exhibition award. In 2017, Sue achieved OPA Signature Membership Status for her outstanding accomplishments in representational oil painting. This show at the Dare Gallery will run from Friday May 3 through Sunday May 31, 2019. This full show of work can be previewed by visiting www.edwarddare.com. “Being Present”, a new collection of original oil paintings by Sue Foell will open on Friday evening, May 3rd at the Dare Gallery, 31 Broad Street, Charleston, SC. This series of paintings is about connections and moments reminding us to live our best life; by taking time to yourself, feeling the calm and quiet of dawn, really focusing on a soft touch on skin, snuggling with a puppy, savoring the glistening of fresh strawberries, contemplating the meditative beauty of the sea or the warmth of sunrays on your face. Sue Foell has always found joy in creative pursuits and “making things”, but she did not have a traditional academic art education. Her ever growing masterful body of work and the number or prestigious awards for this work would lead you to believe otherwise. Foell says that she has very early recollections of watching her father, a high school art teacher sketching head studies of her and her siblings, which sparked an interest in portraiture that would blossom later in life. Although she majored in Computer Science in college, the many art courses she took while there and later from several other private instructors gave her a strong foundation for her paintings today. 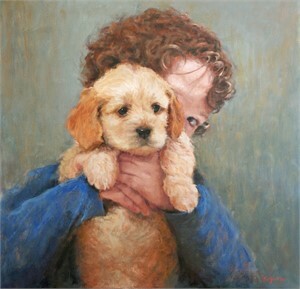 After working as a graphic artist for 14 years, she took a portrait workshop in 2001 from prominent Houston portrait artist William J. Kalwick, Jr. She knew right away that portrait painting in oil was what she was born to do and continued to study with Mr. Kalwick for the following four years. 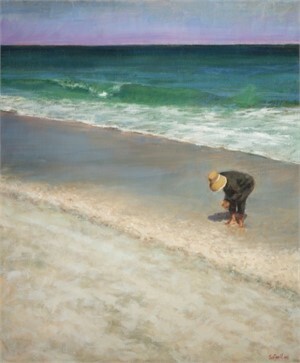 Sue also studied still life painting with Bruce Williamson and Qiang Huang and landscape painting with Roger Dale Brown. Foell says that all of these resources have definitely made her a better painter, but that the far most valuable tool in honing her skills has been actually putting in the hours of painting daily. Based in Raleigh, NC, Foell describes her style as traditional realism or contemporary realism painted with a bit of looseness. “My ideas come from seeing something that grabs my attention that I can’t easily look away from. It could be a scene, a person, an object, just something beautiful that captures my attention and I feel like I have to capture it by painting it! It usually comes from the way the light is hitting the subject or a romantic emotion coming through. Dramatic lighting is so beautiful. The strong patterns of light and dark that attract me to the subject in the first place are what unify my body of work, regardless of the subject matter.” For figurative pieces and landscapes, FoelI photographs and paints from her photos. She says, “For still life, I paint from life since they don’t move on me and painting from life is always better. I don’t really do any kind of sketch to begin, but start right in with paint, blocking in the main shapes and values. As the painting progresses, I add more of the small details while trying to leave areas of the painting understated, sometimes with the original brushstrokes remaining. When I am working on a still life that is small or medium in size, I try to finish it “alla prima”, or before the paint dries. In all of my work strive for economical brushwork – not to overwork the painting.” Foell’s convincing sense of light and shadow, confident brushstrokes, strong drawing skills, and use of rich color give a special strength to her paintings. Her work is also critically acclaimed, receiving numerous major national awards over the last twelve years. 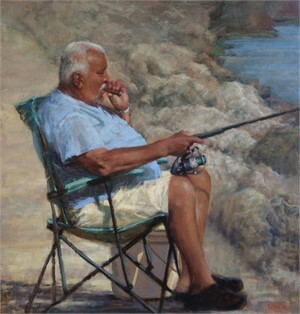 Some of the awards of note are the Figurative Award of Excellence at the Oil Painters of America’s 2015 National Exhibition of Traditional Oils, having paintings accepted into the Salon International from 2007 through 2013; acceptance into the Oil Painters of America’s Eastern Regional Exhibition and/ or the National Juried Exhibition for eleven of the last twelve years; and the 2019 Virtuosos of the OPA Exhibition award. In 2017, Sue achieved OPA Signature Membership Status for her outstanding accomplishments in representational oil painting. This show at the Dare Gallery will run from Friday May 3 through Sunday May 31, 2019. This full show of work can be previewed by visiting www.edwarddare.com.